Energy storage is not a new concept, but today 99% of energy stored is still in the form of pumped hydroelectric systems. 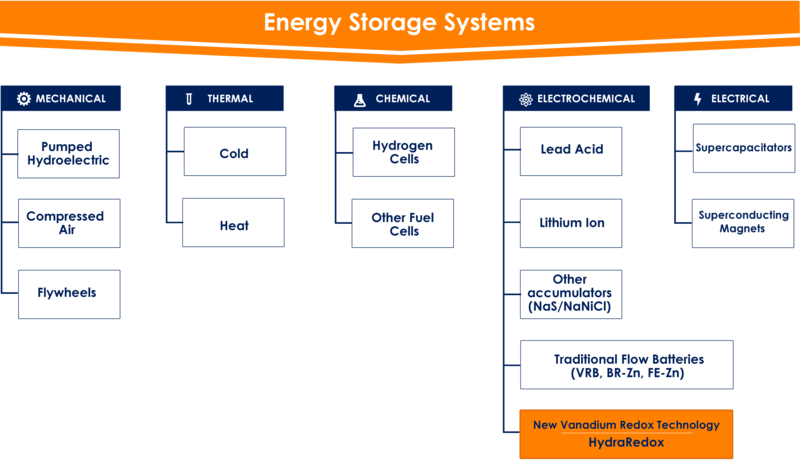 Other stationary storage technologies (mechanical, thermal, electric chemical and electrochemical) are in various phases of development and have very different characteristics. Amongst these, electrochemical storage has long been regarded as one of the most promising solutions for large scale applications. There are two types of electrochemical storage: solid state batteries and flow batteries. Solid state batteries are known as ‘closed systems’ such as Lithium ion (where the relationship between power (kW) and energy (kWh) is a fixed ratio) and the energy is stored as an electrode. Flow batteries (redox and hybrids) are also referred to as ‘open systems’. In flow batteries, the energy is stored in the form of electrolytes (an aqueous solution) and power and energy can be independently sized. Lithium Ion technology is experiencing rapid market growth. However, it still faces challenges of flexibility, scalability, safe operation and environmentally friendly recycling, which grow exponentially in the MW market of renewables. Flow batteries offer a viable alternative. Vanadium redox batteries are formed of two independent sections: power and energy. The power section consists of electrochemical cells that convert chemical energy to electrical energy (and vice versa). The energy section consists of two tanks (positive and negative) in which the energy is stored in chemical form in a solution called the electrolytes. Each cell is made of two compartments, one with a positive electrode, the other with a negative electrode, separated by a membrane. The electrolytes are pumped from the tanks into the two compartments and come into contact with the electrodes. Through a chemical reaction called redox (reduction-oxidation) the composition of the electrolytes changes, creating a shortage of electrons at the positive electrode and a surplus at the negative electrode. 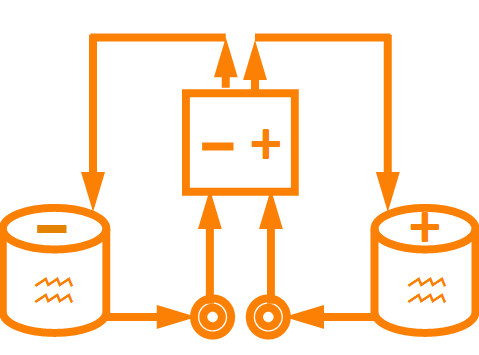 During the discharging cycle (when the battery supplies energy), electrons flow from the negative to the positive terminal, generating an electrical current. During the charging cycle (when the battery is accumulating electricity from external sources), an electrical current is applied to reverse the redox reaction. HydraRedox has developed a radically new approach to vanadium redox which addresses and overcomes the shortcomings and limitations of conventional redox flow technology and offers a cost-effective solution for large scale energy storage with a product ready to match the requirements of the renewable sector today.